Not ready to try a Wicked Green Smoothie? No worries. 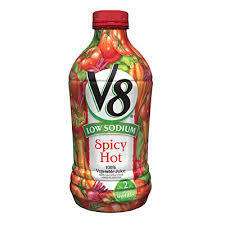 Here’s an easy peasy way to start…Go to the store and buy a bottle of spicy hot V-8 juice. Pour 16 oz into a blender. Add a few sprigs of parsley or a couple slices of cucumber or a few leaves of spinach. Blend and pat yourself on the back for being good to your body.